Abstract. Aqueous chemistry in atmospheric waters (e.g., cloud droplets or wet aerosols) is considered a potentially important atmospheric pathway to produce secondary organic aerosol (SOAaq). Water-soluble organic compounds with small carbon numbers (C2–C3) are precursors for SOAaq; products include organic acids, organic sulfates, and high-molecular-weight compounds/oligomers. Fenton reactions and the uptake of gas-phase OH radicals are considered to be the major oxidant sources for aqueous organic chemistry. However, the sources and availability of oxidants in atmospheric waters are not well understood. The degree to which OH is produced in the aqueous phase affects the balance of radical and non-radical aqueous chemistry, the properties of the resulting aerosol, and likely its atmospheric behavior. 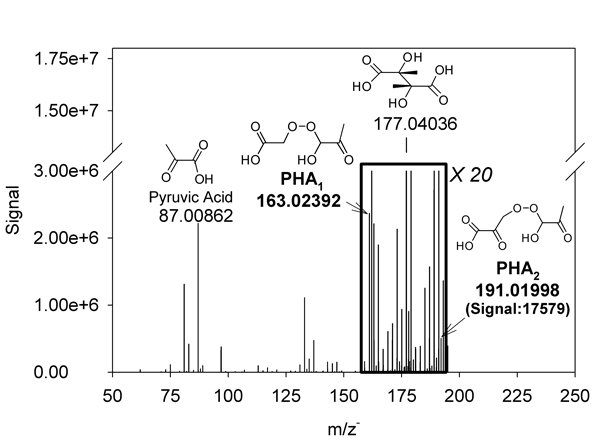 This paper demonstrates organic peroxide formation during aqueous photooxidation of methylglyoxal using ultra-high-resolution Fourier transform ion cyclotron resonance electrospray ionization mass spectrometry (FTICR-MS). Organic peroxides are known to form through gas-phase oxidation of volatile organic compounds. They contribute secondary organic aerosol (SOA) formation directly by forming peroxyhemiacetals and epoxides (i.e., IEPOX), and indirectly by enhancing gas-phase oxidation through OH recycling. We provide simulation results of organic peroxide/peroxyhemiacetal formation in clouds and wet aerosols and discuss organic peroxides as a source of condensed-phase OH radicals and as a contributor to aqueous SOA. How to cite: Lim, Y. 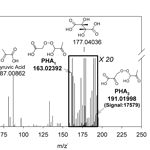 B. and Turpin, B. J.: Laboratory evidence of organic peroxide and peroxyhemiacetal formation in the aqueous phase and implications for aqueous OH, Atmos. Chem. Phys., 15, 12867-12877, https://doi.org/10.5194/acp-15-12867-2015, 2015.